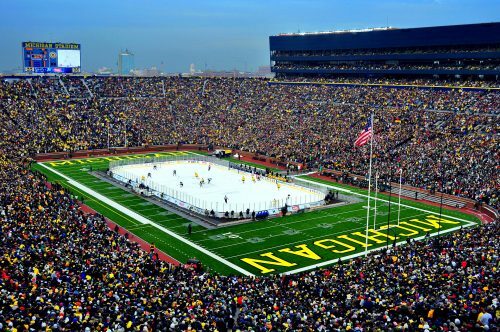 The University of Michigan is home to the largest stadium in the USA (the second-largest in the world!). So what better place to test for spectator-induced seismic activity than The Big House? 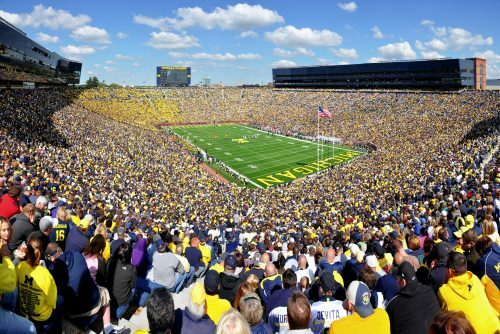 University of Michigan geology professor Ben van der Pluijm decided to make waves by measuring the seismic activity produced during games at the university’s 107601 person-capacity stadium. Because earthquakes are (thankfully) very rare in the Midwest, and therefore very rarely experienced by van der Pluijm’s introductory geology class, he hoped this approach would make the movement of the Earth more accessible to his students. To measure the seismic activity, van der Pluijm used a Raspberry Pi, placing it on a flat concrete surface within the stadium. He then sent freshman student Sahil Tolia to some games to record the moments of spectator movement and celebration, so that these could be compared with the seismic activity that the Pi registers. We’re not sure whether Professor van der Pluijm plans on releasing his findings to the outside world, or whether he’ll keep them a close secret with his introductory students, but we hope for the former! We’re not sure what other technology van der Pluijm uses in conjunction with the Raspberry Pi, but it’s fairly easy to create your own seismic activity reader using our board. You can purchase the Raspberry Shake, an add-on board for the Pi that has vertical and horizontal geophones, MEMs accelerometers, and omnidirectional differential pressure transducers. Or you can fashion something at home, for example by taking hints from this project by Carlo Cristini, which uses household items to register movement. I have to wonder about it being positioned on concrete of the stadium. Concrete transfers vibration better than earth. Might have been interesting to place it on the field in an out of the way place. November 24th is the Ohio State game. I imagine that should bring about the largest readings unless the Buckeyes shut down the Wolverines early. Nothing like getting stomped to quiet the crowd. Go Blue! Never mind! That games is at Ohio State. Duh! This includes some details about the results and answers the question about the technology doing the sensing (it’s a raspberry shake). Plus a super photo of U-M geologist Ben van der Pluijm himself.